Clan Newlands is an armigerous clan without a Chief. A prominent member is William Alexander Newlands, Baron of Miltonhaven, of Lauriston Castle in Aberdeen County. He is member of the Convention of the Baronage of Scotland. A Scottish Baron is approximately equal with my armigerous rank of Gentleman. It is not a homogeneous clan as far as I can tell, the only way to trace the origin of a male Newlands is Y chromosome DNA. The name “new land” may come from anywhere. The name Nieland occurs in Trondheim Norway, and the name Newlands all the way down from Shetland to Edinburgh. Clan mac an Taoiseach or Mackintosh is of course an authentic Highland clan, of the famous Clan na Chattan, and so is Mac Thomaidh, who are descended from Mac an Taoiseach. These are true or homogeneous Highland clans, descended from one or very few individuals and all related. Hence the name “clan”, or children. This was the ancient Celtic way of life, which also existed here in Wales to some extent. The land was not owned by anyone in the Highlands, not even by the Chief. In my opinion the land should all be given back to those cleared from it, and it should be resettled in the ancient way. They would have the right to demolish turbines. This is based on the idea of reasonable force, to be determined by a jury. In my opinion I am entitled to forcibly apprehend any stalker by reasonable force, without weapons, and hand him over to the police, this would only be done in an emergency. The police advise not trying to apprehend them personally and this is what I also advise. Some stalkers or vandals are very dangerous. I worked with the local police for eight years to successfully clear biker vandals from Gelliwastad and Craig Cefn Parc, without any means of self defence such as a truncheon or tazer. I confronted the criminals verbally on several occasions, often outnumbered on remote moorland, and handed over number plates to the police. I was frequently assaulted in various ways by being grazed at up to about fifty miles an hour by a heavy motor bike, and covered in mud by deliberate spinning of a back wheel, frequently subjected to violent verbal abuse. I was doing my duty as Armiger (a member of the untitled nobility in Wales). No Councillor would do their duty. Seemingly angelic horse riding vandals are just as bad. In the end they set the entire ecology ablaze and ruined it totally as is well known. The police are frequently assaulted by these biker criminals. There should be a military style crackdown against them and all bikes scrapped. The police are not allowed to use tazers or plastic bullets, only a police truncheon. In my opinion they should be allowed to use tazers, and as a last resort, live ammunition after a warning shot over their heads. Horse riding vandals have ruined the footpaths and foul adn obstruct the narrow roads. I use a different route now. I sustained quite a lot of ligament damage but I am now recovering. The ancient law of Wales was that of my ancestor, Y Brenin Hywel Dda, (King Hywel the Good) and people were certainly allowed to defend themselves, again with reasonable force. The police and I have finally cleared Gelliwastad but the Council and Beaufort Estate (an absentee aristocratic landowner responsible for wind turbines) have done absolutely nothing at all. There are still no gates, which could very easily block access to what is let of a unique ecology, which is very little. I know this because I was born here in this very house, and returned after many years to see a sad ruin of the past. cc Martin Caton M. P. Gower. Agreed completely! Wind turbines are a scam based on scaremongering. In the Commons yesterday there was a tense stand of between MP’s and executives of power industries over the issue of green taxes which are preventing the economy from coming out of a long recession. It all comes from a corruption of Baconian science. Subj: Fwd: FW: Global Warming!!! Ian Rutherford Plimer is an Australian geologist, professor emeritus of earth sciences at the University of Melbourne , professor of mining geology at the University of Adelaide , and the director of multiple mineral exploration and mining companies. He has published 130 scientific papers, six books and edited the Encyclopaedia of Geology. Of course, you know about this evil carbon dioxide that we are trying to suppress – it’s that vital chemical compound that every plant requires to live and grow and to synthesise into oxygen for us humans and all animal life. I know….it’s very disheartening to realise that all of the carbon emission savings you have accomplished while suffering the inconvenience and expense of driving Prius hybrids, buying fabric grocery bags, sitting up till midnight to finish your kids “The Green Revolution” science project, throwing out all of your non-green cleaning supplies, using only two squares of toilet paper, putting a brick in your toilet tank reservoir, selling your SUV and speedboat, vacationing at home instead of abroad, nearly getting hit every day on your bicycle, replacing all of your 50 cent light bulbs with $10.00 light bulbs…..well, all of those things you have done have all gone down the tubes in just four days. One year – think about it. Of course, I shouldn’t spoil this ‘touchy-feely tree-hugging’ moment and mention the effect of solar and cosmic activity and the well-recognised 800-year global heating and cooling cycle, which keeps happening despite our completely insignificant efforts to affect climate change. Anymore, but just ‘Climate Change’ – you know why? And, just keep in mind that you might yet have an Emissions Trading Scheme – that whopping new tax – imposed on you that will achieve absolutely nothing except make you poorer. Posted in asott2 | Comments Off on Global Warming!!! This is the tartan of Clan Newlands, probably of Norse origin back in time from Edinburgh to Caithness and Sutherland, Orkneys, Shetlands and Trondheim in Norway. The DNA from father to son should be the characteristic Norse type, which is slightly different from the rest of Scandinavia and very ancient in origin. Norse or old Norwegian is spoken Iceland. There may be remnants of it in remote areas of Norway. Written Norwegian is almost the same as written Danish. 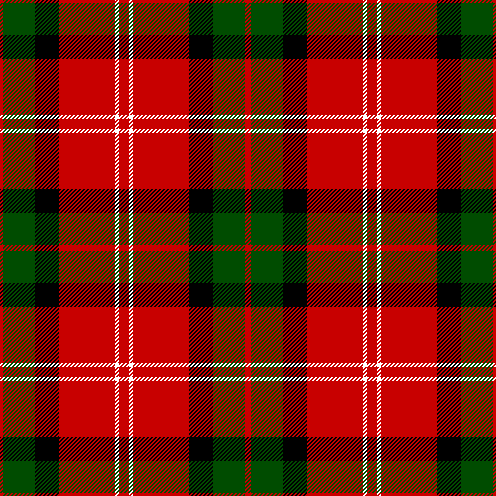 This is the tartan of Clan mac an Taoiseach (Clan Mackintosh) from whom I am descended via the Newlands line. This is an image of the tartan of Clan Mac Thomaidh of Glen Shee (children of Tomaidh Mor, or Thomas the Great) from whom I am descended through the Newlands line as researched by my cousin Vivienne Swaby, who is also of course entitled to wear this tartan, along with that of Clan Mac an Taoiseach (Mackintosh, children of the Chattan Clan Chief). Tomaidh Mor was a grandson of William Mackintosh, 7th Chief of Clan Mackintosh, 8th Chief of Clan na Chattan (Children of the Wild Cat, the great confederation of clans). I can understand a lot of Gaelic words because they are so similar to Welsh. For example, in the earliest extant poem written in Cumbric (a type of British Celtic, there occurs “llewyn”, which is the wild cat, a medium sized cat native to Britain. The modern Welsh for cat is cath, and chattan in Gaelic. Mor is Mawr in Welsh. I would not be seen in a kilt myself, it leads to chilled kneecaps, but it is worn throughout the world of course. Clan is plant in Welsh, via the well known c to p transformation of Goidelic to Brythonic Celtic. Originally the two languages were the same, proto Celtic, which crystallized in the Iberian Peninsula about six thousand years ago. So Spanish and Portuguese, Catalan and so on have many Celtic words, so does French and Swiss German. This is found as usual at the end of the attached feedback book for www.aias.us, recording the 2% higher education sector and similar. The other 98% covers all walks of life and is of course physically impossible to record by hand, but is recorded on computer for anyone interested. Up to 30th October for www.aias.us there were 74,166 hits, 15,867 distinct visits (about 150,000 readings), 49,896 page views, 2752 documents read, 12.19 gigabytes downloaded from 89 countries led by USA, Canada, Germany, Mexico, Russia, Romania, Britain, Poland, …… So a huge amount of interest as usual and congratulation to all staffs! The essay broadcasts by Robert Cheshire were very popular as usual, and were heard an estimated 2400 times. The daily reports give all detail of which document or broadcast was read or heard in which university and similar. The final returns for October will be in tomorrow as usual. There were 3075 hits from 499 distinct visits, 12.4% spiders from baidu, google, MSN and softlayer. Auto1 201, Auto2 69, Feedback Book 69, Evans Equations 46 (English) over a thousand (Spanish) Englynion 22, Autosonnets 20; Second Book of Poetry 14, Autoarchive 11 to date in October. European Centre for Nuclear Research (CERN) UFT166(Sp); California Polytechnic State University San Luis Obispo Educational Note 2; Ohio University 2D paper by Douglas Lindstrom; Public Net Portland State University UFT166; University of Central Florida UFT176; Mathematics University of Houston UFT42; Andalucian Junta Essay74(Sp); University of Barcelona UFT152; Laboratory of Algorithmic Informatics Universite de Paris Diderot Geometric Theory of Fields; Department of Computer Science and Engineering University of Ioannina Greece Potential Waves; School of Advanced Computing Mexican National Polytechnic Institute UFT149(Sp); Hewlett Packard Europe UFT166(Sp); Faculty of Science Free University of Amsterdam UFT42; Wellington Girls’ College New Zealand UFT43; Bihor University Romania UFFT43; Intelbi Company Russia general; Girton College Cambridge UFT85; University of Wales Swansea UFT171. Intense interest all sectors, attached usage file updated for October 2013. The blog owner who made these threats is liable to from the years to life imprisonment if there is a significant risk of serious harm if he is released from prison (Criminal Justice Act 2003). The making of a threat to kill is an offence where the defendant intends the victim to fear it will be carried out, whether premeditated or in anger. Repeated threats to kill will probably result in an indeterminate prison sentence of up to life in prison. So the number of threats on the blog should be listed. There are many such threats, so the judge will probably take them all into account. Other threats of violence, including verbal violence as on the blog, may be prosecuted summarily under the Public Order Act of 1986. The blog owner is probably “Aaron Vee”, so his accomplices are liable also to summary prosecution. “Aaron Vee” was traced to Aberystwyth in 2010 and to Cambridge in 2013. His computer IP is known and the overwhelming opinion is that he should be arrested as soon as possible. The police are acting with efficiency. Obviously “Aaron Vee” is a criminal, not a scientist. As a public figure I get a lot of threats and so on. These are a couple of typical “veiled death threats”, and typical of the behaviour of a predatory stalker as defined by the psychologist Mullen in a nineties study of stalker psychology. The South Wales Police have recently opened a second on going investigation in to these felonies. It is known that Waldyr Rodrigues, P. W. Atkins and a David Fisher of Zuerich are associated with activities of the stalker “Aaron Vee”, well known to the police. So they have self destructed as reputable scientists. I have advised the AIAS group to take suitable precautions. I am responsible for their safety as the AIAS President, and the buck stops here in the words of President Truman. If identified, Aaron Vee faces imprisonment. Threats such as these are serious felonies. This message is from a person who wishes to remain anonymous. All e mail addresses are removed from this blog with the exception of my own e mail address. “a .45 would have been very comforting… A word of advice, Alex: no point in having an impressive fence at the front if the fence at the back is weak. You really should replace that bent fence-post; an old mattress and, ole, any peon could have it away with your bug or pickup” (end quote). Also, individual researchers are being stalked, and their personal information is being posted on a stalking website (occupation, pictures of business location, description of how to break into their buildings, what cars the researchers drive, etc). The entire stalking blog is geared at harrassing a single researcher, with no other goal. The target of the threats and abuse is the physics researcher, Dr Myron Evans, who is a highly trained mathematician and physicist. His work is valid research, and he should not be a victim of arbitrary threats, abuse, and harassment, nor should his researchers have to live with stalkers who visit their employers, then post personal details on the web. I will be happy to email a list of the threats, and evidence of stalking done by the stalking blog, and I will call to speak to an admin, if needed. It is likely the stalking blog is being funded by certain vested interests, to discredit the new physics discoveries. In the interest of all mankind, please do what you can to stop the harrassment of real researchers, like Dr Evans. I will be happy to help in any way I can. You are currently browsing the Dr. Myron Evans blog archives for October, 2013.